Did y'all do anything for the opening ceremonies of the Olympics last Friday? Any themed festivities? Or are y'all not as cheesy as I am? Well, I had a few people over for some English themed noshing and beering. We had a ploughman's, complete with pickled onions, Stilton, Sweet Red Onion Chutney, and Colman's mustard. I got some English beers. One brewed in North Yorkshire where my mom is from. For dinner, my boyfriend fried up some fish and I baked up some potato wedges until crispy for fish and chips. And for dessert I made a traditional English trifle, using Harvey's Bristol Cream sherry pursuant to my mom's instructions. It was awesome and festive, and I loved it. I've sort of come to terms with my cheese ball tendencies, especially when they result in epic themed meals and an excuse to drink leftover sweet sherry for dessert. My boyfriend's mom was also in town. 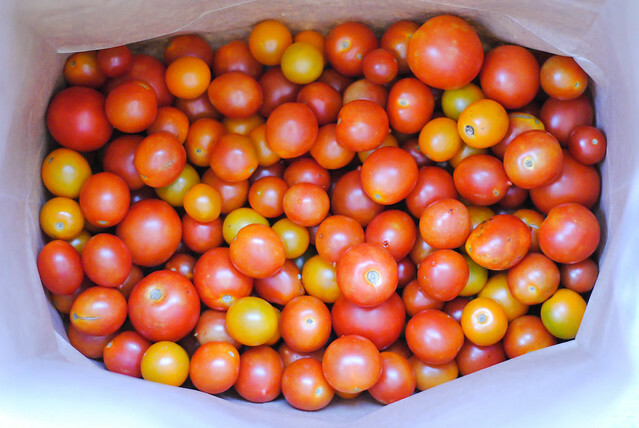 And she brought with her a bunch of peppers and potatoes and two huge bags of gorgeous heirloom tomatoes of all sizes from her garden in Virginia. Such a nice mom! We used the potatoes for the chips in the fish and chips, and a bunch of her tomatoes were quickly gobbled up off the ploughman's. My boyfriend made bacon jam last week, which is stupidly delicious in an incredibly obvious way. Bacon and sugar. Yeah. Duh. So since the basil on the balcony has gotten crazy huge, and since we have an abundance of tomatoes, I thought I better use them all. 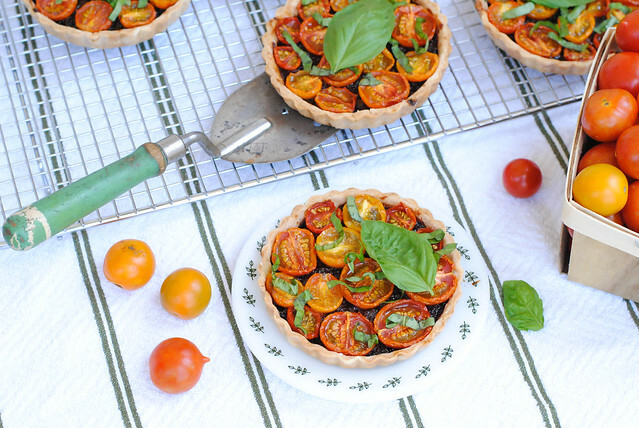 Heirloom babies + bacon jammin' + massive basil + tartlet obsession = BLT tartlets! You're welcome. And about this tart crust. It's all butter. It's tender and flaky yet crisp and appropriately sturdy. It's simple. It's easy to make, easy to work with. It keeps well. It works with sweet and savory fillings. It's pretty fantastic. You'd be a fool not to take it, run with it, fill it, bake it, eat it, etc. Preheat oven to 375 degrees F. Roll dough out to 1/8-inch thick. 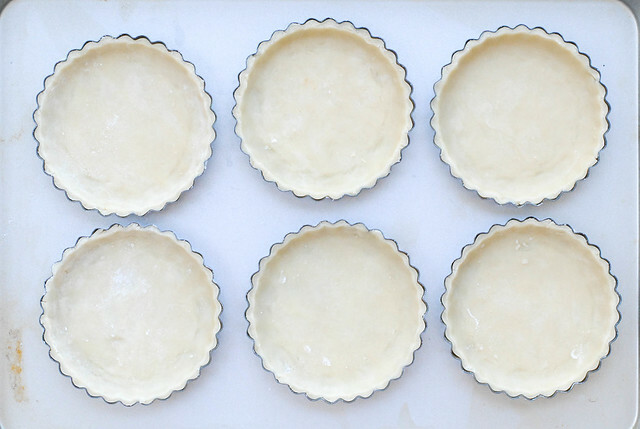 Cut out circles a bit larger than the tartlet pans (you won't end up using all the dough). Shimmy dough into the pans, lightly pressing into the corners. Trim excess overhang dough. Place in the freezer for about 15 minutes. Remove pans from the freezer and arrange on a baking sheet. Using the back of a spoon, spread about 1 1/2 Tbsp. of bacon jam onto each tartlet until evenly covering the bottom. If it's too thick to spread, you can heat it up a bit to loosen it. The jam is pretty intensely bacony, so don't overdo it. A little goes a long way. 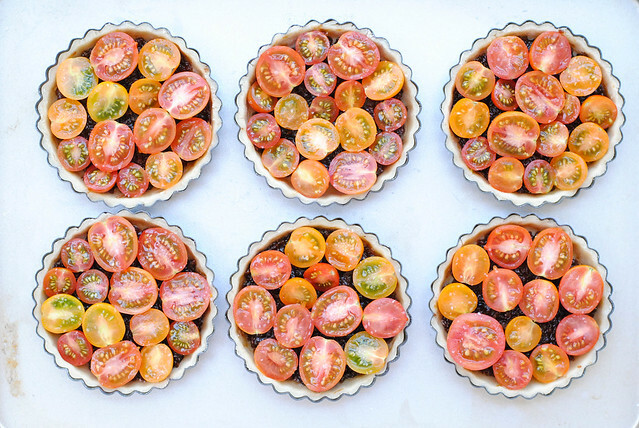 Arrange tomatoes over the jam cut side up, fitting as many as you can without overlapping them. 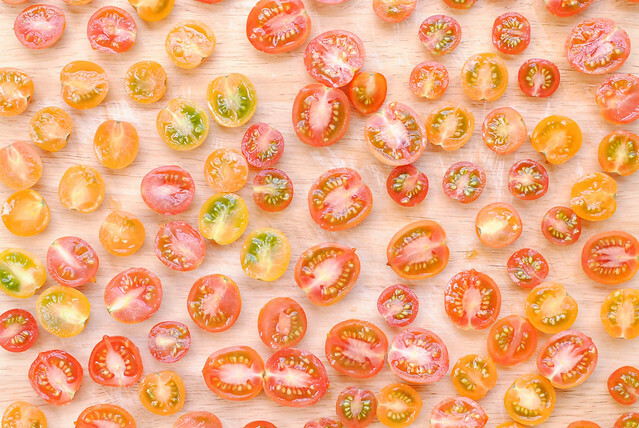 Brush tomatoes lightly with olive oil and sprinkle with salt. 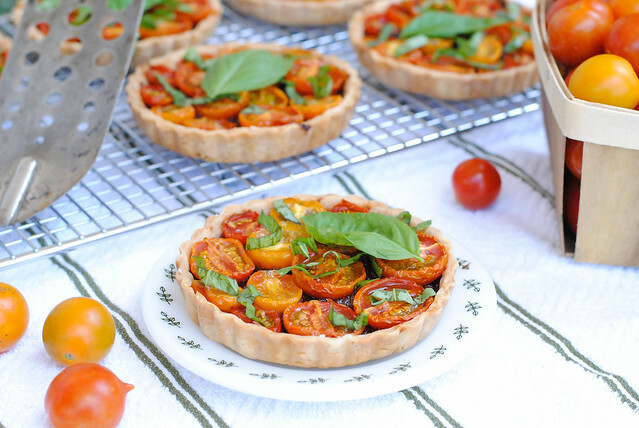 Bake for 1 hour, until crust is golden and tomatoes are wrinkly and collapsed. 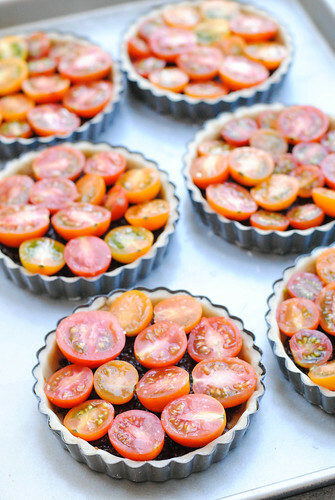 Let tartlets cool until pans can be handled then remove tartlets from the pans and let cool completely on a wire rack. Stack about six large basil leaves on top of one another, roll up long ways, and chop into 1/4-inch strips. Sprinkle confettied basil over the tartlets and and top each with one whole basil leaf (or more, if you're so inclined). In the bowl of a stand mixer fitted with the paddle attachment, mix flours, salt, and butter on low speed until they begin to come together. In a small bowl, lightly stir the egg, water, and juice with a fork then pour into the flour-butter mixture. Continue to mix on low speed just until dough forms. Be careful not to over mix. Dump dough onto a counter, gather all the bits together (do not knead or overwork), wrap tightly in plastic wrap, and refrigerate for at least 2 hours before use. Dough may be stored wrapped tightly in the refrigerator for about two weeks and in the freezer for up to two months. In a medium sauté pan, cook bacon until browned on the edges. Pour off fat into a heatproof container to reserve for other use (do not wipe pan). Add onion and garlic to pan, season with a bit of salt and pepper, and cook over medium heat until onions are translucent. Add brandy, vinegar, and sugar, reduce heat to low, and cook until thickened, about 20 minutes. Let cool slightly then transfer to food processor. Add maple syrup and process for a few quick pulses until bacon breaks up a bit, and the texture is uniform. You still want it to be a bit chunky, not smooth. Store in a mason jar in the refrigerator. wanting this so hard right now! my stomach is growling. I like themes, they help set a mood and narrow people's ideas in a good way. The worst is when you're asked to bring a dish to share and not given any ideas! I totally agree. A little direction always helps when requests are made! Those pics are irresistible!! Omg- YUM. Bacon jam is genius. Seriously. 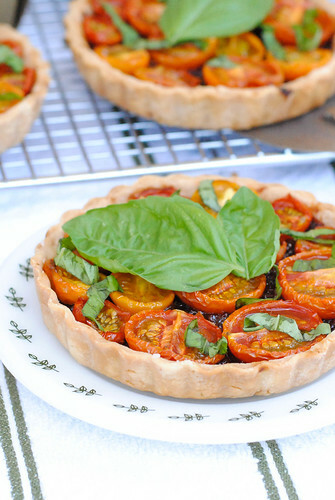 And plus the fresh tomatoes and basil... this looks so good!! Thank you! Isn't bacon jam like the greatest thing ever imagined? I want it on my burgers forever. Lovely Photos... 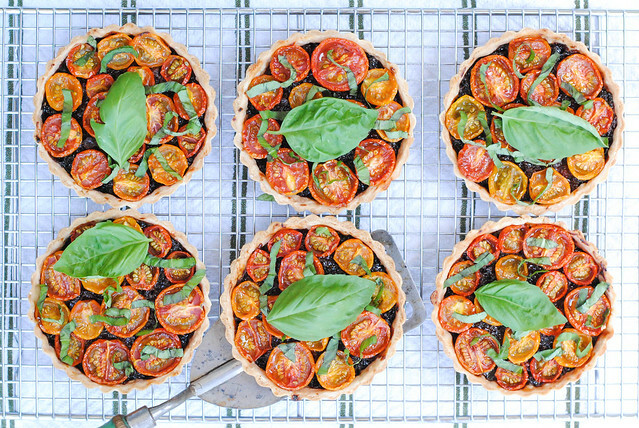 These tartlets sound incredible! Thanks vicky. They are rather lovely! Nice post. These look great and I'll have to try'em out someday. I also love the shot of 'halved tomatoes' on the cutting board. It makes a nice graphic. Would be a cool background. 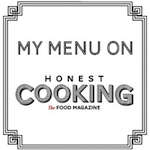 Thanks for the twitter follow! Hope to hear and see more from you. Thank you. I loved how beautiful the tomatoes looked once I halved them. Such gorgeous colors. 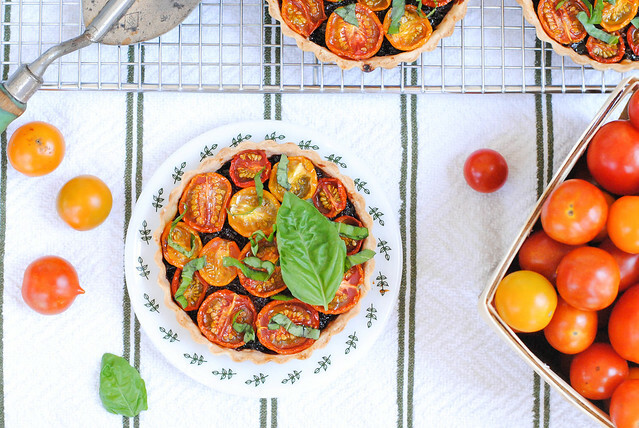 You could absolutely substitute with balsamic vinegar with super tasty results! I might try that myself actually. Red wine vinegar would be great as well. Let me know how it turns out for you!